I was in what used to be the Amdo province of old Tibet but is now called Qinghai, in western China. 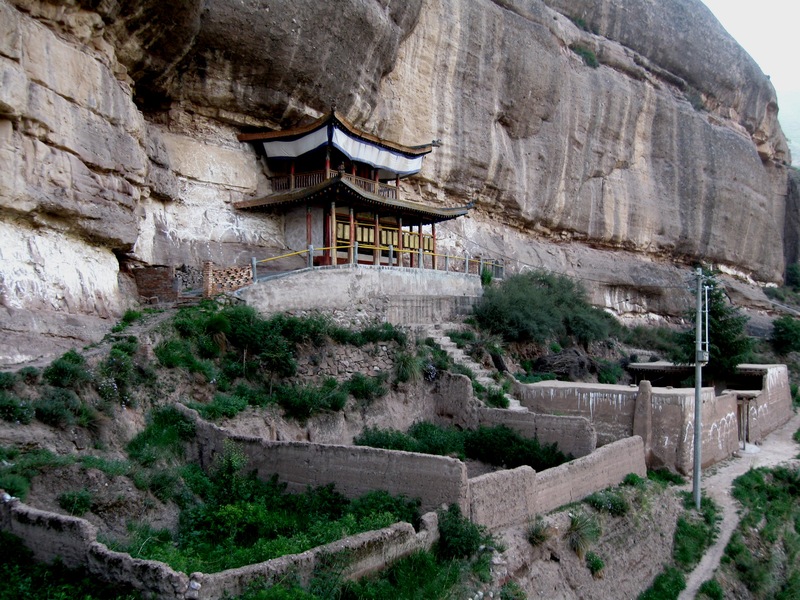 Someone in Xining told me about little known and less visited monasteries high in the mountains near Xining where incredibly there are still no roads. How could I resist? Armed with a hand-drawn sketch off I went. With me was Emmy, a dutch photographer I had met in Xining. We figured that with her half-baked chinese and my sketchy Amdo, we could muddle our way through. From Xining we took a shared minivan to a smaller town and from there to an even smaller town squished in with the locals in a minivan among bags of shopping. The village closest to the monastery lay across a few high passes and we found ourselves travelling in the open flatbed of a truck. Once over the last pass, we could see a lush valley protected by a ring of high mountains. Squares and rectangles of verdant green of barley fields and eye-popping yellow of mustard fields were spread everywhere in the valley. The bright headscarves worn by the women showed occasionally among the fields of tall waving crops. 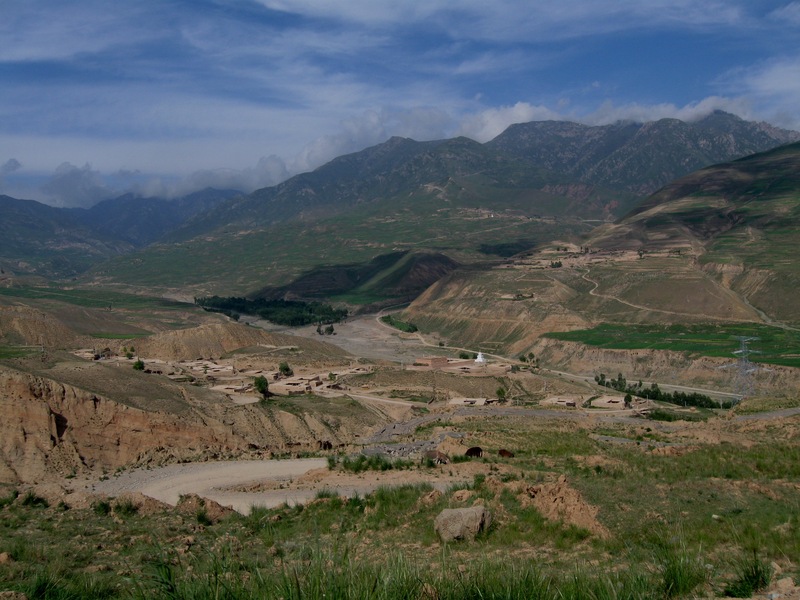 This valley had just a handful of villages, each with is own chapel, marked by a stupa. The white of the stupas were blinding in the bright sunlight and seemed to shine against the packed-mud houses of the villages. 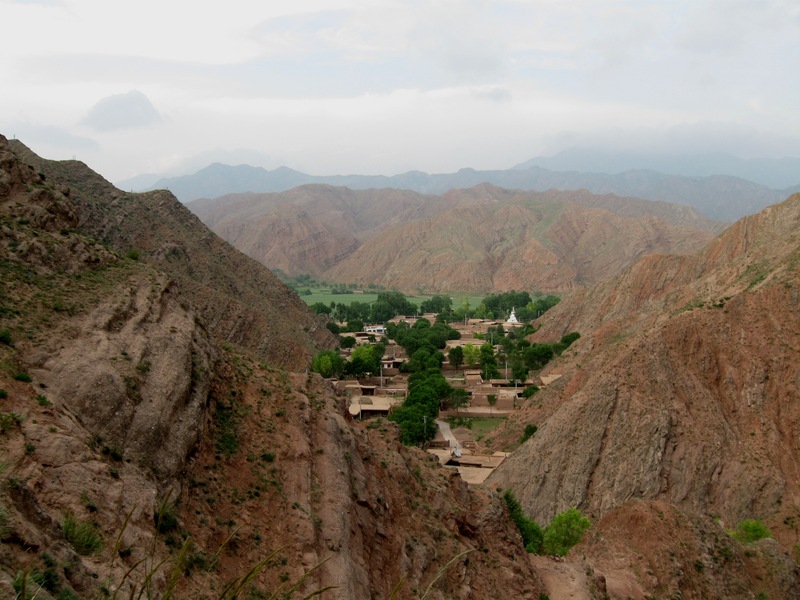 The structure of the houses is the same as traditional Tibetan houses – flat-roofed and made of packed mud, they almost seem to grow out of the mountains and cliffs. This is a village as yet unmarred by the concrete monstrosities that one sees elsewhere. The small lanes that run through the village are lined with poplars and willow trees. It had a startling similarity to the villages around Ladakh in northern India. But then again, perhaps not so startling after all. It is similar too in the friendliness of the people. It was late in the day but instead of staying the night at the village, we decided to walk on. The villagers told us which path to take in the mountains to reach the secluded monastery. They had mentioned that the walk should be just an hour. Emmy and I walked, climbing steadily. We passed a woman and was startled to see not one or two but three baby goats poking their heads out of her shawl, under her arm and over her shoulder. After three hours we saw no gompa, nor any people and it was getting dark. We had forgotten to take into account that these are people who routinely walk the mountains and probably sprint up the slopes. Not to mention that their sense of time is fairly elastic and not to be confused with the actual time of a watch. Reaching the top of a pass, we decided to stop and look for shelter. In a rare stroke of brilliance I had left my tent behind at the village since we were planning to sleep at the monastery that night. Not only that, we only carried enough food and water for the trek. 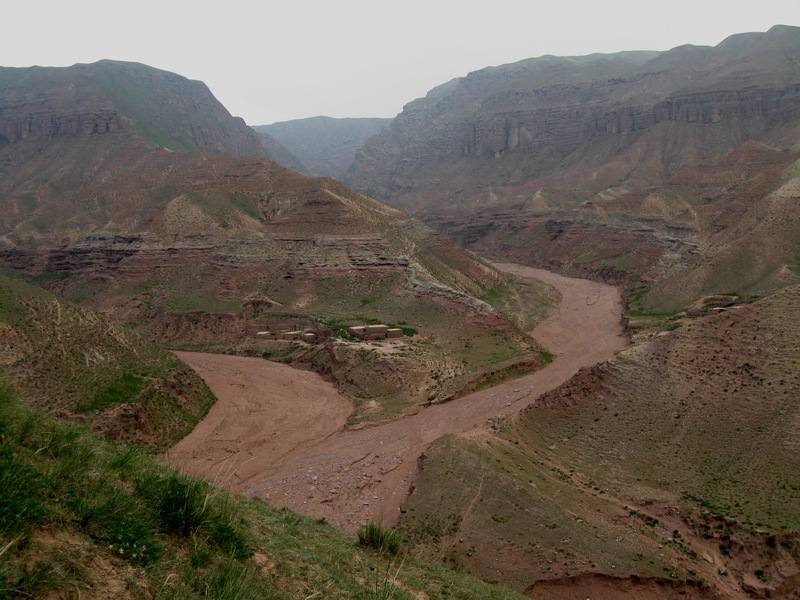 Although I did have tablets to treat water, the river beds were bone-dry. But no matter, we thought. A day without food wasn’t likely to kill us and we did have our sleeping bags. From the prayer flag-draped pass we could see down one valley and in the distance made out one small building. Thinking to ask for shelter and directions we literally flew down the steep scree-covered descent. It was then that we discovered that the house was just a storage shed, the lock held together with a bit of wire. 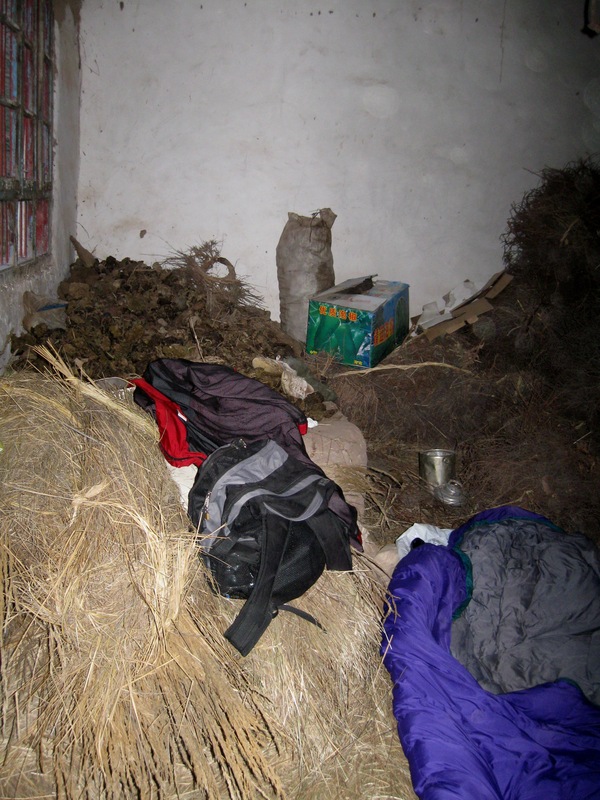 I quickly added breaking and entering to my list of accomplishments and found the shed full of hay, straw and dried piles of yak-dung that are used as fuel in these parts. We piled some of the straw on the floor to make lumpy beds and put the sleeping bags on top. We were sheltered from the biting wind – really, what more could one possibly want? We even had company that night – a mouse or possibly rat that was upset to have his home invaded. Early the next morning, just as we were trying to decide whether we should keep going or backtrack, we saw a lone herder coming up the valley and sure enough, the gompa we sought was down that way – just five minutes away he said. Of course we now knew the five minutes needed to be re-calibrated. It was probably more like thirty for us. And so it was. The valley narrowed as we climbed down, the walls began to resemble a canyon. We saw the gompa tucked into the side of the canyon, hidden from view from almost all sides. This is one of the oldest monasteries in this region, and unlike most others that have been destroyed, this was relatively unscathed because of its inaccessibility. It had started as a series of caves in the mountain where famed masters have meditated. One such cave was supposedly even used by the Buddha or so the legend says. It was certainly used by an Indian sage who later founded the Tantric college here. In fact the original cave where he meditated still exists and is now a shrine of worship. It has never been a large gompa and today is even smaller than is used to be with about a hundred monks. We were lucky enough to arrive on a day with a special ceremony in session. All morning we watched the prayers and the rituals being perfomed with the clash of cymbals, the wail of long horns and the thudding of drums that reverberate in one’s gut. Monks robed in maroon with the tall yellow hats of the Gelugpa sect chanted prayers as the tendrils of incense curled into the air. Lit by the glow of yak butter lamps, the deities painted on the wall seemed to peer down on us. 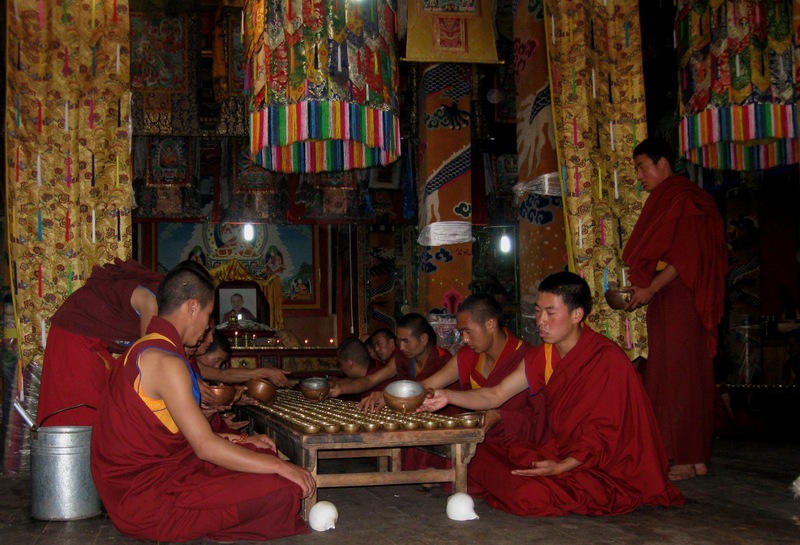 Young novice monks rushed back and forth with kettles of salt butter tea, refilling cups during the breaks. 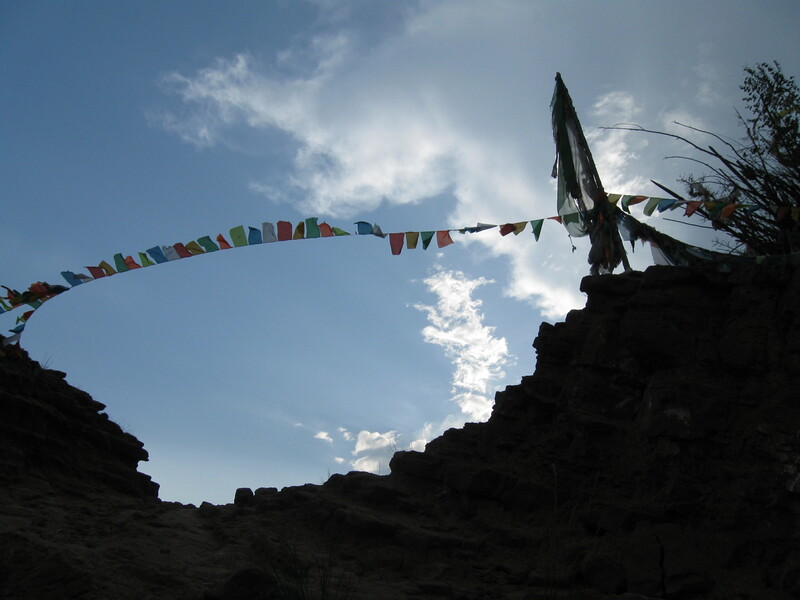 Prayer flags flapped in the breeze outside and the chanting drifted on the wind, reflecting off the walls of the canyon. High in the sky circled a couple of hawks. No roads lead here, nor are there any towns or villages visible nearby. The world outside seemed to have ceased to exist. Hidden from the world, it felt completely isolated and surreal. I felt I had been transported into pages of The Lost Horizon in the valley called Shangri La. 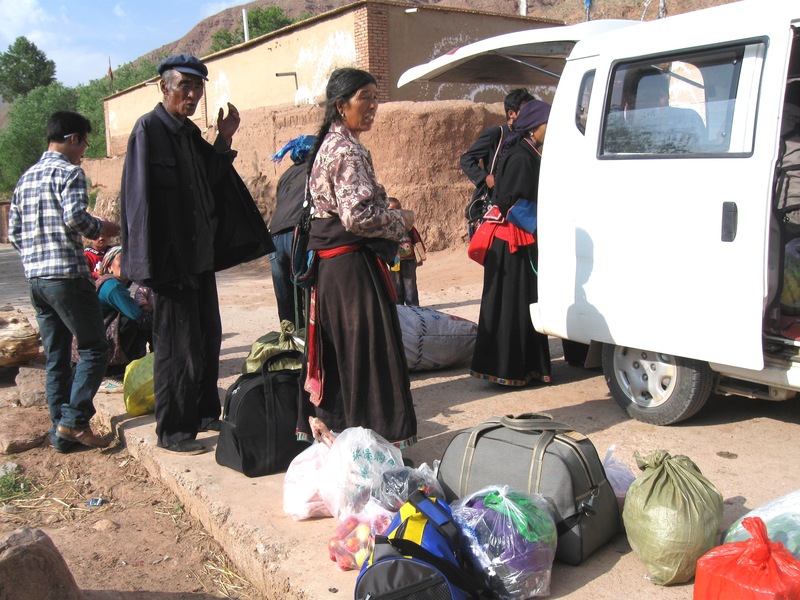 Amdo: One of he provinces of old Tibet and also the name of the dialect spoken here. It is different from the Tibetan dialect of Lhasa. Stupa: Built in traditional shape they usually contain relics of monks and are considered sacred. Ladakh: Province in northern India, it is part of the Tibetan plateau and has historical, cultural and religious ties to Tibet. 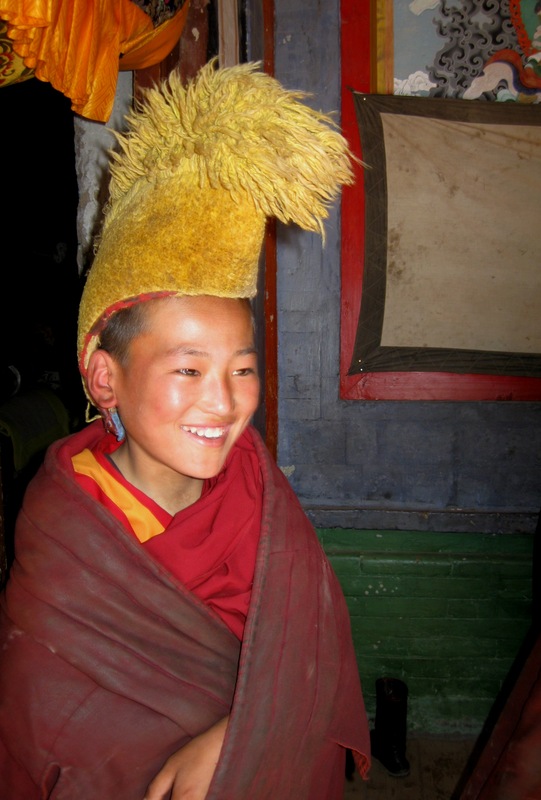 Gelugpa: One of the sects of Tibetan Buddhism, popularly known as the yellow hat sect.